I realized how much the short walk had benefited me….. I just got back from a mid-morning walk on a sunny winter day. I didn’t get the best night’s sleep last night and was feeling a bit unmotivated and stuck around updates I want to make with my business and on my website. So I decided to let go of the struggle and go outside for a walk. The sun and the fresh air immediately began to clear the cobwebs in my brain. And by the time I was heading home, I had all sorts of ideas and clarity as to how I want to proceed with my business changes and my website updates. The added bonus was I had no plans to do a blog today, but as I walked in the door I realized how much the short walk had benefited me and I had to share. This practice can be used to help you become more clear and confident in any part of your life, including with your riding….. I often talk about getting outside in nature as part of a mindfulness practice. It really does help me to let go of my worries and become more present and clear headed. This practice can be used to help you become more clear and confident in any part of your life, including with your riding. If you have had a busy day and are heading out to the barn to ride, take a moment to go on a short walk, if the weather allows. It will help you let go of your busy day and become more present for your ride. If you don’t have time to take a walk or the weather is bad, slow down and really connect to the process of grooming and tacking your horse. That will have the same benefit of bringing you into the present and connecting to the task at hand. A nice walk after you ride can also help you to understand what worked and what didn’t…. A nice walk after you ride can also help you to understand what worked and what didn’t in your ride. You can take that time to learn from your mistakes and focus on what went well. Then once back from your walk, you can jot down all your thoughts in a journal to help you keep track of your plans and your riding progress. Whenever you feel stuck in any area of your life, just get up and talk a walk or do something different for a short time that you enjoy and that takes you away from your worries. You will be amazed at how you will find clarity, make plans and be able to move forward towards your goals! Change can be so scary for many reasons. Underlying beliefs can prevent us from moving forward into change and from continuing the process of change when things get tough. I know this from my own experience. I have made many changes in my life, so I am not a stranger to change. I have learned over the years to be thoughtful about major changes and not just jump into something because I want to move away from something I don’t like. 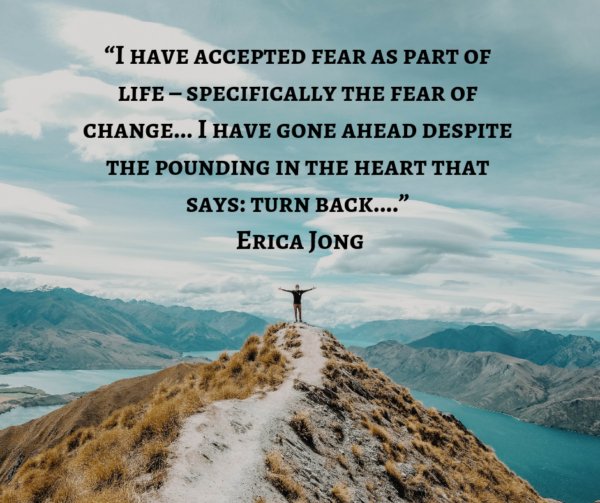 I have also recognized that I default to my comfortable place when a change I have made seems to be getting risky, scary or tough. Looking back, I realize that sometimes that has prevented me from some potentially wonderful opportunities, if I had just stuck with it. But I have also learned it is best not to attach myself to regrets, but instead use those experiences as lessons to help me move forward in the present. Letting go of regret is hard work but worth the effort. It is an up and down process but each time you can let go it gets easier the next time. Successful change is a process, not a reaction. It’s important not to jump into change. You should really do some self-reflection and understand what is going on and where you truly want to go. First you need to create an awareness around what it is you want to change. Then it’s time to discover your blocks to change. What are the underlying beliefs that are preventing you from moving forward? Is it a fear of failure, lack of confidence, a need for perfection, worry about the judgment of others or a need to always be in control? These are just a few of the beliefs that can block you from change. Once you gain the awareness around your blocks you can then begin to change those beliefs. Understand that this is your path, it’s nobody else’s. Your path may look very different than others and that is okay. Don’t follow a path just because that is what you think will please those around you. Discover what your mindset its and what about it that may be preventing you from moving into change. Also realize that you can shift your mind and thinking. The science of neuroplasticity has discovered that the brain can change it’s default thought patterns if you are willing to work hard at creating new beliefs. I will do a follow up post on neuroplasticity and mindsets and go into it in more detail. But for now, just know that it is possible to change your thought patterns. Creating a mindfulness practice through meditating, journaling, walking in nature, cooking, gardening or some other reflective quiet practice can help you find that awareness and clarity as to where it is you want to go. These quiet times are when you can look at yourself without judgment. Just lean in and look. Discover what is going on and what beliefs and habits you would like to change. Find the path that is right for you. Begin to define where it is you want to go and what it is you want to do. Create an intention about how you want to live going forward. What is so nice about creating intentions is that they are a way of being more than dong. They don’t have an endpoint. You want to create definable goals as well. But understand that some goals may not be achieved at all, they may change significantly or your timeline to your goals may move as you go along. That is okay. That is why change is a process. It’s fluid. There will be ups and downs and surprises. But if you create a vision for what you want, a road map for where you want to go and an intention for how you will walk through life as you move along your path you will able to manage any roadblocks that come along. 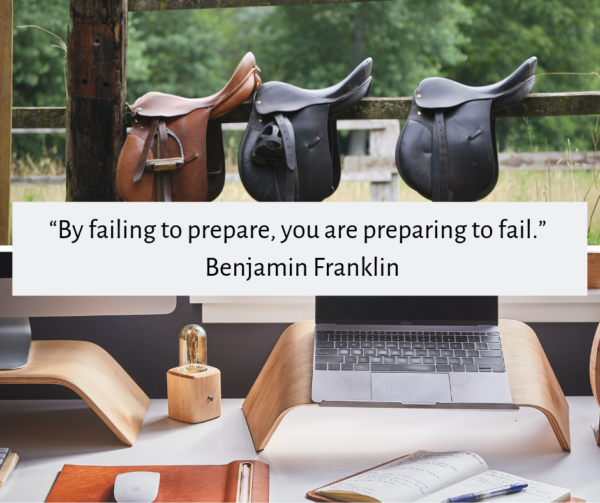 You will prepared for them ahead of time. Where in your life do you want to make change? This process can be applied to any area of your life. You may want to make a change in your riding, your career, your business or your day to day life. The process of being mindful and more aware will begin to give you clarity around what it is you would like to change and what type of change is most important to you. Remember this is your path. Don’t let the judgment of others or self-judgment prevent you from going where you truly want to go. This doesn’t mean you can’t have mentors and teachers or get feedback from others. Use the advice you get to help you find the path to change that is right for you. Take the advice that works a let go of what doesn’t. Coaching can support you through change. I find passion in supporting others as they find their best path to being their best self. I am excited to announce that I will be starting another coaching business that will compliment The Mindful Equestrian and also stand on its own. It will be called Create Your Path to Change. I will be focusing my coaching on adult equestrians, equestrian entrepreneurs and equestrians who want to create change in their careers and lives. I will be happy to coach non equestrians, but this will be my focus to start. My background in the equestrian world, coaching, education and business counseling is a unique blend of experience that I hope can be of benefit to many! This process of change for me is still in its infancy and I am now in the middle of creating my road map for the future. I know I will be offering one on one coaching still, but I am also planning some exciting group coaching offerings that will make coaching more affordable. But the best part about group coaching is the knowledge and experience that the whole group can bring to the sessions. I am so excited about this new direction! Part of the process of getting through the scary part of change, is that once you have decided to make a change and you know where you are heading, is to be able to say it out loud to the world. So here it is! I am facing my fears and announcing this to you! There is still much to do. So keep checking in. I hope you will join me and Create Your Path to Change! How often do you struggle when you ride, trying to fix something about your position or something that you do? Quite often, I bet! Now ask yourself, when you are trying so hard to fix something in you, how much focus do you have on what is happening with your horse? Maybe not so much? Hmmmm…..interesting thought to ponder, isn’t it? Now don’t beat yourself up for this as it happens quite a bit. In fact, shifting the focus from the rider to the horse is the main theme when I teach riders in lessons and clinics. It’s not because I care more about horses than riders. It is because once a rider begins to focus on the horse’s way of going, performance and connection there will be improvement in both the rider and the horse. You may be thinking, why is this the case? When a rider only focuses on themselves their ride becomes separate from the horse underneath them. This often leaves a rider locked up trying hard to maintain position. Their minds are totally focused on themselves and they are not listening to the horse through their body and mind and thus they have no feel. In this case, horses can become unbalanced, crooked, numb or resistant. Just think about how you feel when you are the recipient of a one sided conversation. It’s not so much fun is it? Moving focus to how the horse is going, as far as their straightness, impulsion, rhythm and balance, helps a rider begin to relax. Riders begin to let go of the worry about fixing themselves and pay more attention to creating the best ride in their horse. 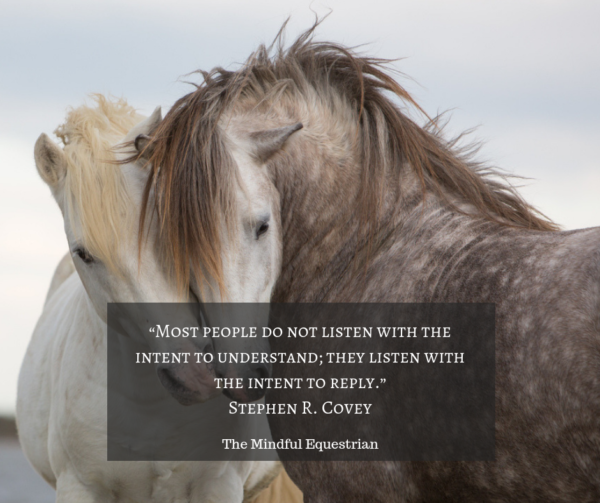 The focus is now on having a two sided conversation with the horse, where the rider listens and then responds thoughtfully to what the horse is telling them. To best create a positive two sided conversation, riders should first educate themselves on horse anatomy, movement, behavior and balance. They should understand what the ideal horse is, as well as what the best way of going should be. Then they need to understand that no horse is perfect, just as no rider is. They are all individuals, so horses need to be ridden as such. A single horse can be different on different days. If rider focus is only on themselves there will be no awareness of what is happening with the horse they are on in any given moment. In my clinics I have been developing a way of teaching to shift the rider’s focus to the horse. I ask riders questions about horse anatomy and way of going in general and then I ask about their horse in particular. Many riders struggle to answer my questions. It’s not because they don’t care or that they don’t work hard. It’s because their focus has been somewhat myopic. What is so interesting is that rider confidence grows as the focus begins to shift to the horse. They get out of their own way and start to have fun paying attention to the horse and making the corrections needed to improve the overall ride. At the same time, horses generally improve their way of going and are happier. The rider’s position begins to correct itself organically when the focus turns to using position to connect with the horse and to make regular subtle corrections as needed.I am not saying that good work on position shouldn’t happen. But,understand why the great riding masters of the past came up with the equitation that we do today. It was to get the best and most pleasing ride from the horse. It was not developed to look pretty on top of the horse. A connected and feeling rider will look good on a horse, as the whole picture is unified, balanced and fluid. Certainly study how a correct position creates the best ride and work on self-improvement. But don’t do this without always keeping your connection to the horse at the front of your mind. So study the horse just like those great masters did. Be more mindful of your horses and what they need from you to be their best. Always be curious, ask questions and continue to learn and grow. Shift more focus from you to your horse. You will become a better rider for it! I often write about change and how to embrace it instead of pushing it away. 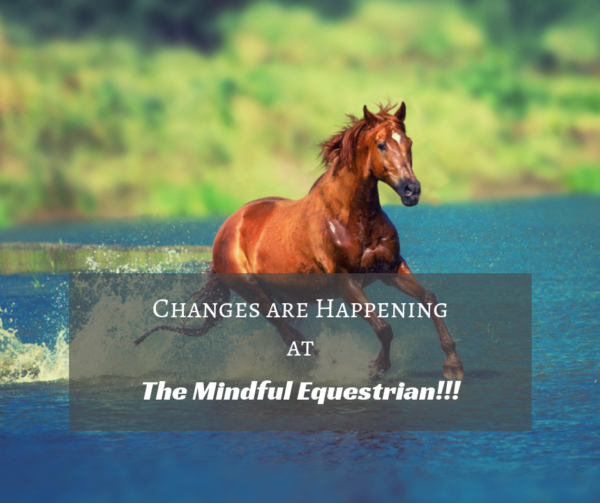 This month I want to share that I am planning on making some changes with The Mindful Equestrian, both in its branding, approach and offerings. In my other job as a business counselor I encourage and support clients not to be afraid to make changes in their business and that it is good to be open and pay attention to what clients may want and need. I also encourage clients to not wait until something like their website, business cards, social media pages, etc. is perfect before they launch. The need to be perfect blocks any kind of forward motion. You need to get in the trenches and try things and then see what works and what needs to be changed. This is the same with riding. If you wait until you are “perfect” before you go to a show or do whatever goal you desire, you will stay right where you are and never move forward. This will be the 4th revision of my website and a continuation of many smaller changes I have done along the way. 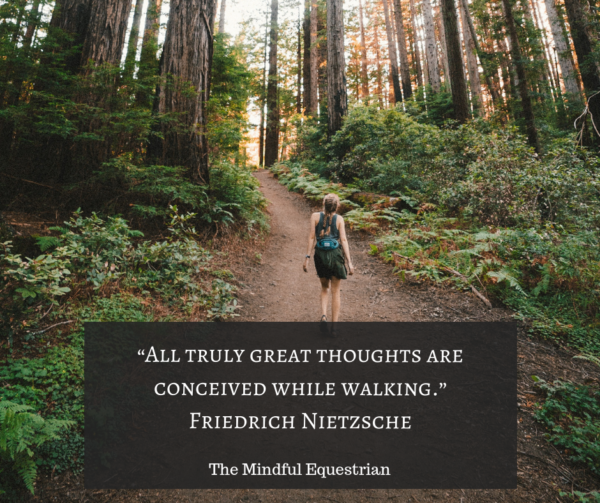 I am doing this, as I want to make it easy for you to find what you need from The Mindful Equestrian’s offerings and that those offerings are what will serve you best. I am still in the planning stage of this. I would like to ask you for feedback on what type of offerings and services you would like. 1. IEA and IHSA team riders. 2. Adult riders past college age. 3. Trainers, instructors and other professionals. 4. People seeking life/career coaching. There will be also business coaching designed just for equine related businesses. 1. 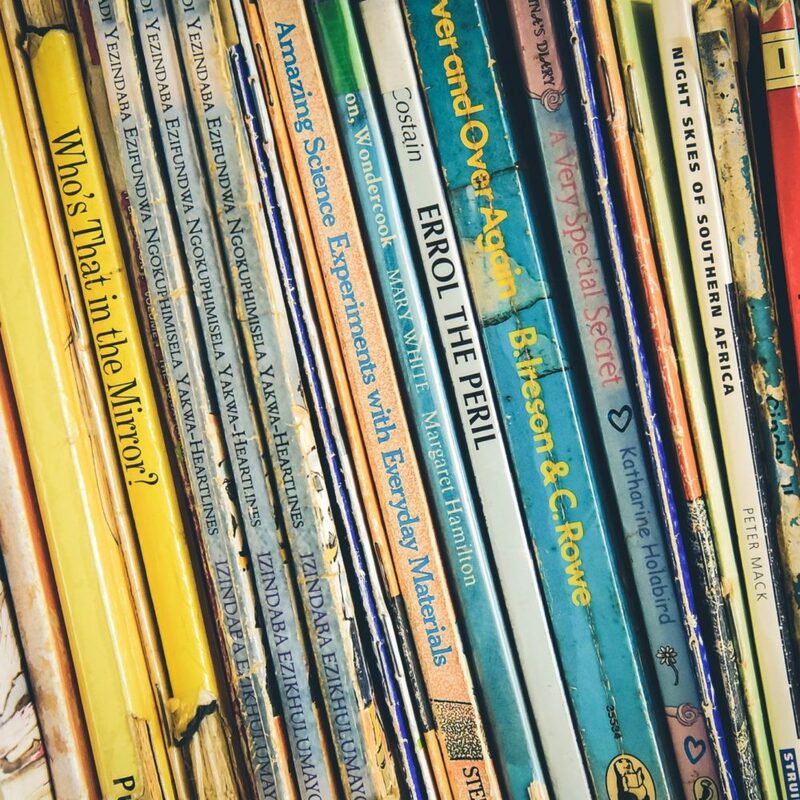 Some simple and easy to use course offerings and resources. 3. Group coaching, classes and mastermind groups all by phone. 4. Some combination of teleclasses, group and one on one coaching. 5. Clinics, talks and workshops will still be available. I plan on incorporating Facebook groups with many of these offerings so you can all connect with group members. Please send me any feedback in the comments or by email at lisa@mindfulequestrian.com as to topics you would like offered around performance coaching, life coaching and business coaching. Also, let me know what you think about the different client categories and coaching formats. I am very open to suggestions as I would like to tailor what I do for your needs. I will be looking forward to hearing from you! I am so excited about the change!